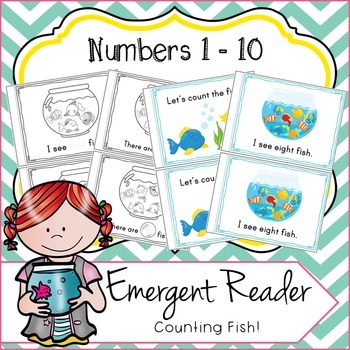 Emergent Reader Numbers 1 - 10, Counting Fish! 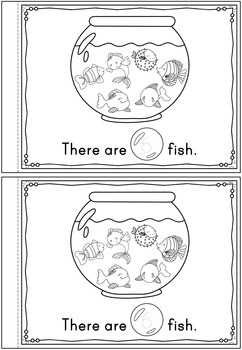 Emergent Reader Counting Fish (Numbers 1 - 10), 50 pages, color and in black and white! This emergent reader is great for classroom books, guided reading groups, homework, or literacy center activities! Black & White: Count the fish and colour them in. Trace the word and the numeral. 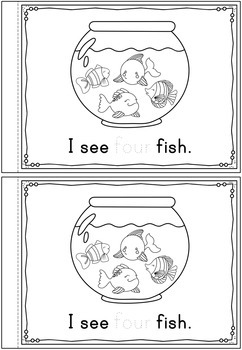 Colour: Count the fish. Read the words and the numerals. Perfect for reading to the class or placing in your book corner for independent reading. These have not been numbered. This allows you to choose to include all the pages, or use only the numeral/word pages. Sight words focused on: I, see, there, are and number words 1 - 10. - Let's count the fish! 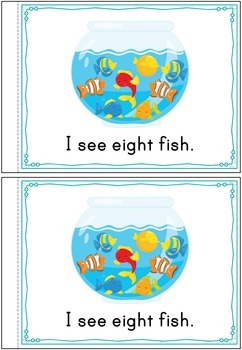 - I see ____ fish. - There are ____ fish. - There are lots of fish! You might also be interested in my Emergent Reader Numbers 11 - 20! Or my Numbers Play Doh Mats! **If printing in the US, simply select either "fit to page" or "shrink oversized pages" in your printer settings, to ensure correct printing to US letter paper.